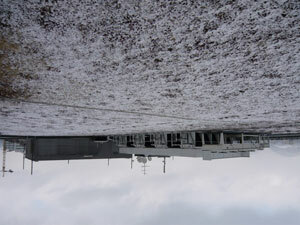 Inger Lise Hansen shot her film in February 2009 above the roofs of Linz with an "inverse" perspective. The super-16mm camera placed upside down was moved centimeter for centimeter from shot to shot. This "stop-motion" technique imbues weather, light and shadow with an unimagined presence. 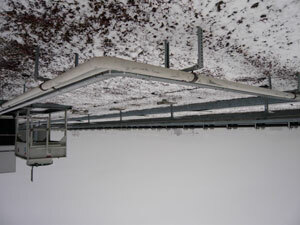 The upside down view across the roofs causes the viewer to lose orientation and conveys a sense of floating at the same time. The filmed sequences recall science fiction films like Star Wars or the cult series Star Trek. The viewers are confronted with unfamiliar phenomena and manifestations, although it is only the surface of the roof of a shopping centre. Hansens film does not beam the viewer into a different world but instead shows how fictional the real world can be. In Parallax Inger Lise Hansen tips the camera, in the same way as her 2006 beach film Proximity, by 180 degrees, sending it on a journey through a spooky landscape where Heaven and Earth seemed to have switched places. Linz’s OK Centrum für Gegenwartskunst commissioned Hansen, its artist in residence, who shot Parallax at in February 2009. A series of tracking shots across the broad, empty flat roof of a department store in Linz, past the open industrial architecture there, past mysterious shafts and passageways, metal frameworks and extended systems of piping. This movement is an illusion, just like the elimination of gravity: All eight tracking shots, which constitute the visual portion of this four-and-a-half-minute work, were filmed as single images, using the technique of stop motion as in animation films. Parallax celebrates the supremacy of the machine over the human gaze, as did Michael Snow’s La région centrale (1971) in a more complex way. By aestheticizing the mechanical gliding of her Super 16mm camera over ice-coated grass and the light blowing snow, Hansen produced a kind of automatic cinema in which familiar temporal processes no longer apply. The clouds move past much too quickly in the lower portion of the picture, a few blades of grass tremble in fast motion, and weak sunlight flickers briefly over the ground like a faulty electrical connection. Even the snow falling upward seems to stop when the camera comes to a halt, subject to a mysterious kind of manipulation. Parallax simulates a denatured world in which even the complex soundtrack soon leaves its distant confusion of voices behind to enter soundscapes that no one can access.